(The following information is provided by the Ciyota organization and is only slightly edited for better understanding. 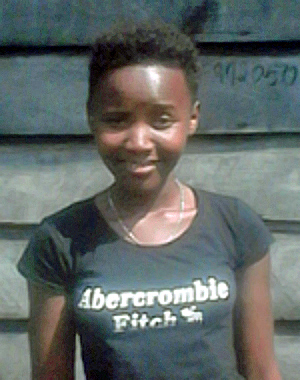 Claudia Feza Bigirimana was born on April 14, 1999 in Buramba, Rutshuru Territory, North Kivu Province in Bwisha Kingdom. She is Congolese by nationality and lives in Goma town, Kyeshero Quarter. She is single and Protestant by religion. Claudia is the daughter of Bigirimana Binyavanga Vianney and Ichimpaye Marie. She is the 5th of 11 children in her family. Her father died, she is orphan. Vision: To become an IT Engineer building a center to help the community learn computer skills. To work with street boys. To drive out tribalism, discrimination. To work with others to build a peaceful DRC. At school I am now in Secondary Six, studying General Padagogy (learning to be a teacher). I did some trainings in CIYOTA such as Social Leadership, Entrepreneurship and Active Non-violence. I Joined CIYOTA 2 years ago and it feels I am in a good family which cares for me. My biological family has no means, we are poor, we are living a hard life since our father died. My father was a veterinary without a job and my mother till now has no job. When my father was alive he did as possible to find us food and education. Since my childhood I faced many problems. I have been studying in school in bad conditions. I’m facing now problem of education and other social problems. I have a vision to become an engineer in IT (computers) to build a center which will help the community to learn computer skills. I will also help the streets boys, teaching them hand crafts, learning them entrepreneurship. I wish one day to kick out tribalism in my country the DRC. I dream an Africa united without discrimination, without violence of human rights, without war. We sell some goods to get some money to survive, even if we are in this bad situation I still keep my vision and one day I will achieve it.